''It was good to just do it for the team and kind of give us a lift,'' he said. Wichita State's Samajae Haynes-Jones stole the ball near the 3-point line and the 6-foot guard exploded for a fast break dunk that turned MSG yellow and gave the Shockers a late double-digit lead. But they faded down the stretch and one of the hottest second-half teams in basketball missed their final 10 shots and over the final 8-plus minutes to head home empty-handed. 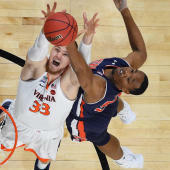 ''The style of play in men's college basketball is healthy and appealing, but the leadership governing the game is interested in keeping the playing rules contemporary and trending favorably,'' said Dan Gavitt, NCAA senior vice president of basketball.